The Pleiades is an open star cluster located in the constellation of Taurus. Six of the brightest stars are easily visible without magnification. The cluster is composed of a reflection nebula about 30 light years across that contains between 300 & 500 stars. Six of the brightest stars are visible from Earth without magnification. In the image to the left, you can mouseover the stars to see their names. The average distance between each star is about 1 light year. The cluster is approximately 50 million years old, which in astronomical time, makes it relatively young. The brightest star, Alcyone, is about 400 light years away from Earth. The seven brightest stars are sometimes referred to as The Seven Sisters, in reference to the mythological Greek daughters of Atlas and Pleione. According to one story, Zeus saved the sisters from Orion by transforming them into doves that later, upon their death, flew into the heavens and became stars. In ufology, the Pleiades is best known for its association with contactee Eduard Meier, who originally claimed to have been contacted by extraterrestrials from a planet in the Pleiades cluster. 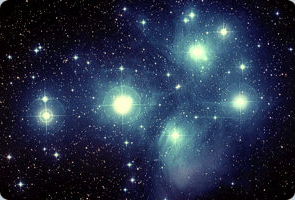 However when astronomers pointed out that the location provided by Meier did not correspond to any of the stars in the Pleiades cluster, Meier started adding that the Pleiadians were actually from the "Plejares" star system, alledgedly beyond the Pleiades. When astronomers continued to scan along the line provided by Meier past the Pleiades cluster, they found no star systems in range there either. So Meier started adding that Plejares was actually in another dimension just out of synch with ours by a fraction of a second. Needless to say, both skeptics and genuine ufologists tend to dismiss Meier's story as a hoax.